Monday. A relentless day boot packing on the Nantillions Glacier, failing once again to ski the Spencer Couloir. But at least I came away with one good photo. 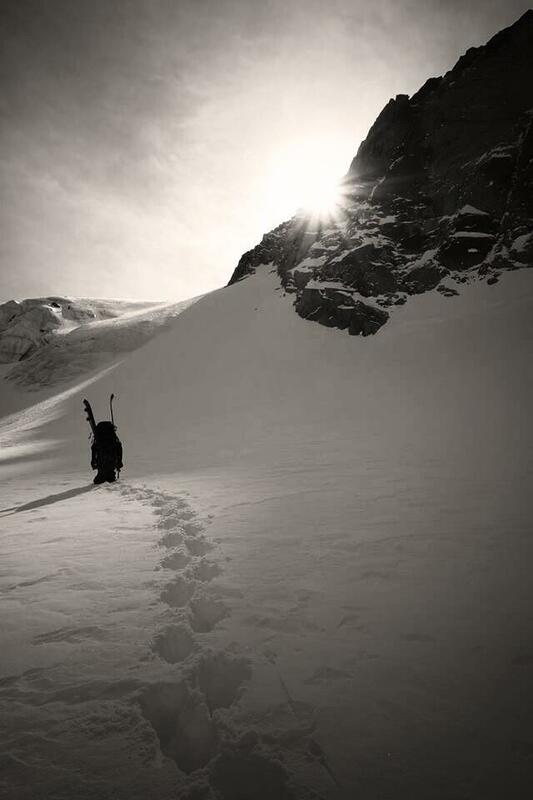 Living with Tom Grant I often hear tales of great skiing around Chamonix. On Tuesday, while I was looking through many guide books and reading conditions updates on the web, he spoke of his recent adventure with Caroline Gleich and Liz Daley in Italy on the North Face of Petit Mont Blanc. They had skied a little known couloir over there and reported great conditions. Armed with this information and a desire to explore every corner of the Mont Blanc Massif I found myself in a van with James Sleigh and Ally Hurst making our way through 11.5km of tunnel with Courmayeur in our sights. Starting in Val Veny you take five lifts finishing on the Arp before you can start the traverse to the foot of the Miage Glacier. Arriving here at 10:20 we started the skin to the base of the couloir and reached it within 45 minutes. Stashing unneeded gear at the base we started the long and monotonous boot pack up this beautiful, atmospheric and steep couloir. With every step we took up it we knew we would soon be enjoying every turn down it. The snow was perfect despite the last 100m being a little crap. I stopped a little below the boys who continued to very near to where the couloir tops out. Perfect chalky powder awaited us and after a couple of jump turns we got a good feel of the conditions and we made some quick tight turns in the narrow sections and we opened up some fast aggressive ‘freeride’ turns where it widened. 700m of steep couloir later and we were back on the Miage. Some of the best, most enjoyable and atmospheric skiing I have ever done. The spring snow descent down Val Veny to catch the lift back to the car was good fun, but the few miles of skating on the flat was less than enjoyable but the smile on my face from the couloir was still evident! The couloir is graded 5.3 but it didn’t feel like it should be given the perfect conditions. Maybe with firm snow or icy hard pack it could be justified! Thanks to James and Ally for some great company, a memorable days skiing and some out of focus photos. Sounds like an incredible bit of mountain. Hope I get the chance to see it before winter’s over.